Learn how to optimize tags for your products in Zentail. On the internet at large, tags are brief pieces of information that might be attached to a blog, a photo, or any other kind of post on a web page. As you can see, a tag is usually just one word or a brief phrase. So, why are tags useful? They come in handy when search engines are scouring through all of the information on the internet. Since a search engine is a computer program, it will scan for all of the information it can find about Scuba Diving and decide which Scuba Diving article is the best. Tags are just one piece of the puzzle when it comes to what a search engine shows first on a webpage when you are on Amazon searching for a product. Using Zentail, you can apply tags to your products. Having each product equipped with a set of thoughtful, descriptive tags will help the products get found by search engines and shoppers alike. Here is how to add tags to a product in Zentail. Now that we've located the tag area, tags can be added to the product and saved. While some products in your catalog may not have any tags, some products may have pre-populated tags, depending on if the products were imported with tag data, or if the brand has tags provided already. Now that the product is tagged, it will have a better chance of being found by shoppers. 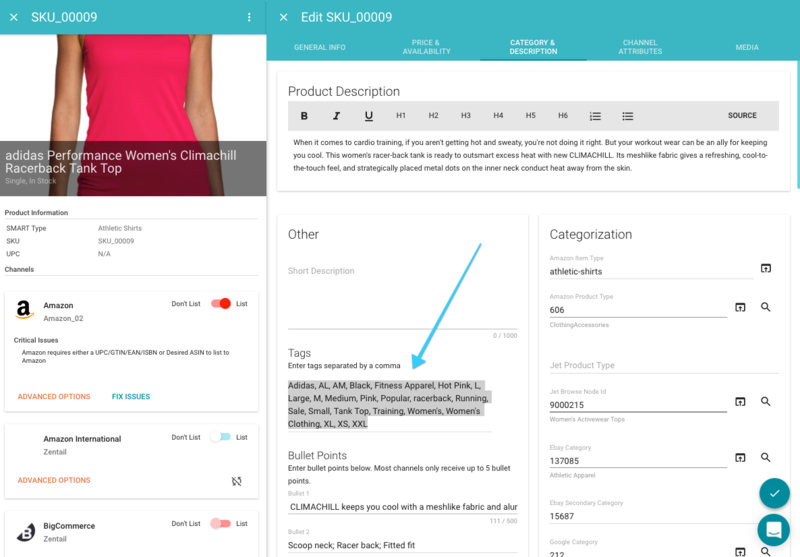 Writing descriptive tags and adding the tags to your products will help the products be located more easily. Tagging products is just one of the components of SEO, or successfully optimizing your products for search engines.